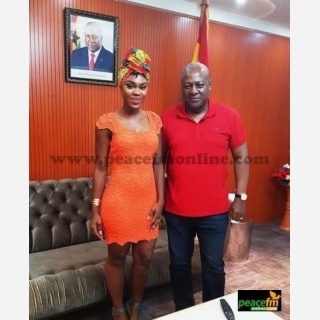 Ghana's Afro-Pop Singer Rebecca Acheampong aka Becca was among a number of musicians who entertained President John Dramani Mahama and other dignitaries at the newly opened Cape Coast Stadium. Becca took to the stage and performed before the President's address on Tuesday May 3,at the Commissioning/Launch of the new Cape Coast Stadium in the Central region. She looked gorgeous in her yellow outfit and thrilled fans to some of her danceable tunes, in addition to her "Hw3", which was a Special request from the President. There was a match between Ghana and China and it was followed by a concert, later in the evening for the people of Cape Coast. Becca again joined other musicians including Bisa K'dei, VVIP and Praye to entertain fans. Fans had an exciting night, especially when Becca did a wonderful performance with Bisa K'dei. Among dignitaries present were the President John Mahama, Sports Minister Nii Lante Vanderpuye, Minister of Trade and Industry Dr. Ekow Spio-Garbrah , other Ministers of State, Members of the Diplomatic Corps, Traditional rulers and Special Guests.